We are pleased to inform you that our Hidden Gem stock of March 2015 - Mold-Tek Packaging Ltd (BSE Code: 533080, NSE Code: MOLDTKPAC) which was released on 22nd Mar'15 is giving as on date returns of 109% to our Hidden Gems members within period of 18 months. Our team suggested Buy on Mold-Tek Packaging Ltd at price of Rs. 109.25 (stock split adjusted price, actual recommended price was Rs. 218.50) on 22 Mar'15 with a target price of Rs. 225 (adjusted target price post stock split, actual target price was Rs. 450). We are glad to inform our readers that stock has achieved our target price, Mold-Tek Packaging stock made its 52 week high of Rs. 229 today and currently trading at Rs. 228 giving absolute returns of 109% to our Hidden Gems members within period of 18 months. We suggest our members to continue to hold the stock. In June 2016 quarter, net profit of Mold-Tek Packaging rose 37.30% to Rs 7.84 crore as against Rs 5.71 crore during the previous quarter ended June 2015. Sales rose 12.93% to Rs 83.25 crore in the quarter ended June 2016 as against Rs 73.72 crore during the previous quarter ended June 2015. Below is the summary of Mold-Tek Packaging Ltd shared by our team under Hidden Gem stock of Mar'15 released on 22nd March 2015. Note: This report is shared only for the purpose of information and not an investment advice. Kindly carry out your own due diligence in case of investment in Mold-Tek Packaging Ltd.
Mold-Tek Packaging Limited traces its origin to Mold-Tek Plastics Private Limited founded in 1985 by Mr. J Lakshmana Rao and A Subrahmanyam to manufacture rigid plastic packaging materials with units located in Andhra Pradesh. The company was listed in BSE in 1993. Subsequently, in 2000, the promoters also commenced outsourcing services for engineering to overseas clients in the USA and EU and the company was renamed as Mold-Tek Technologies Limited. Thereafter in 2008, the company underwent a restructuring process, post which two de-merged listed entities were formed - Mold-Tek Plastics Limited (MTPL), engaged in plastic packaging business and Mold-Tek Technologies Limited (MTTL), which is mainly engaged in offering KPO services for Engineering and Design, specializing in civil, structural and mechanical engineering. Subsequently Mold-tek Plastics Limited was renamed as Mold-tek Packaging Limited. Mold-Tek Packaging Limited is involved in the manufacturing of injection molded containers for lubes, paints food, FMCG and other products. Mold-Tek Packaging Limited is the leader in rigid plastic Packaging in India with 25% market share. Company clientele include Castrol, Exxon, Shell, Valvoline, Gulf, IOCL, HPCL, BPCL, Asian Paints, Kansai Nerolac Paints, Akzonobel (ICI Paints), Amul, Cadbury, Heinz, Hindustan Unilever. Company also exports to UAE, Singapore, Malaysia, Nepal and Bangladesh. The Company has seven manufacturing units of which four are in Andhra Pradesh (all near Hyderabad), one in Daman, one in Hosur (Tamilnadu) and one in Satara (Maharashtra). The combined production capacity is ~25,000 MT per year with over 63 injection moulding machines (Ferromatik, Toshiba, etc.) Multi-location presence helps company to drive cost efficiency and optimizing logistics. The Company has four warehouses in Chennai, Hosur, Kolkata and Kanpur and a marketing office in Mumbai. Mold-Tek Packaging developed In Mold Labeling (IML) decorated packaging for the first time in India. In a growing sector like packaging, IML decoration would be the first choice to improve product`s brand image. IML decorated thin wall containers are suitable for storage conditions like microwave, dishwasher and the deep freeze and are used for food and FMCG products world over. IML offers outstanding quality decoration, and picture quality. Photographic quality and complete container coverage. The IML operations are hands free as handling is done by ROBOTS. Thereby the packaging is hygienic for D2F (Direct to fill) operations. IML can assist in improving the barrier properties to extend the shelf life of the filled goods. The label becomes an integral part of the pail and offers a no-label look. It offers better heat, moisture and chemical resistance. In-Mould Labeling (IML) eliminates the cumbersome decoration step by clubbing it with the production of pail. This results in better efficiencies (50% better lead time) and adherence to container. Mold-Tek Packaging informed that the Company, vide circular dated 19 February 2015 has received an approval from National Stock Exchange of India for listing the securities on National Stock Exchange and commencement of trading with the effect from 23 February 2015. Listing in National Stock Exchange is a good move as it will increase trading volumes and allow Investors to do transaction in both the exchanges.India has a large textile manufacturing base and has the potential to become a leading producer and exporter of nonwoven products. The cooperation between fibre suppliers and nonwoven fibre producers is an important factor for the growth of the industry. Mold-Tek Packaging informed that in respect of the QIP, the QIP Committee of the Company has at its meeting held on 03 February 2015, inter alia, approved the following. Company has issued 24,98,350 equity shares of Rs. l0/- each to QIBs pursuant to Qualified Institutional Placement at issue price of Rs. 220.17 /- per share. Company’s in-house manufacturing of labels and robots considerably reduces the IML costs, hence will lead to improvement in EBIDTA margins. Most of the clients of the company started shifting to IML decorated pails from traditional silk screen printing. As IML offers photographic finish and hands free operation, most of the paint, lube and food companies are gradually shifting to IML. This enables Mold-Tek to lead from the front, as it is way ahead of the rest of the competition in IML decoration in India. Currently, IML Pails and IML Food contribute only 25% and 4% of total sales and have registered strong growth in last one year. Company’s revenue from IML & IML Food segment is gradually increasing which is a good sign as IML segment have higher EBITA margins. Contribution from IML is expected to improve significantly in future. Net profit of Mold-Tek Packaging rose 74.80% to Rs 43.7 million in the quarter ended December 2014 as against Rs 25.0 million during the previous quarter ended December 2013. Sales rose 13.45% to Rs 719.3 million in the quarter ended December 2014 as against Rs 634.0 million during the previous quarter ended December 2013. With ongoing expansion, we believe Mold-tek stands out to be the leading player to capture the rising demand of rigid plastic usages in the organised retail space. 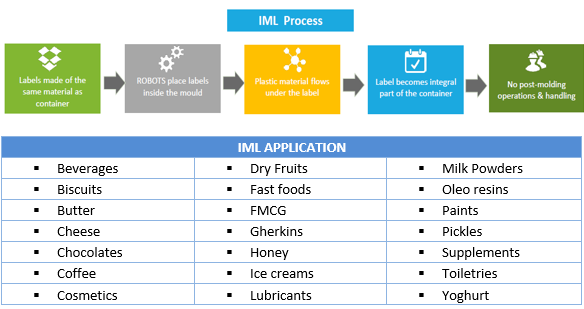 Moreover, increased thrust on In-Mold Labeling (IML) will help company to improve its profit margins by offering value added products to various clients from different sectors. Company is setting up new IML plants in UAE and Gwalior to meet growing demand of its products. Company has also expanded its tool room and IMP thin wall container facility at Hyderabad. i) The company’s capacity addition has come with rising debt levels and debt-equity ratio stood at 1.4 times. Fall in demand of company’s products offering can adversely impact the profitability of the company. ii) Low rupee value augurs well for focusing on exports mainly to nearly countries like Middle East. Company is exporting its products to UAE, Singapore, Malaysia, Nepal and Bangladesh. The Company is adding new robots manufactured in-house to enhance capacity to meet the growing demand for IML products. Appreciation in rupee may have negative impact on exports of the company. iii) Rising cost of capital equipment is also a concern for the company. Company needs to make huge investments towards latest technology / machinery to remain ahead of competition. Rapid advances in other packaging products can adversely impact the performance of the company. iv) As Packaging Industry is a highly fragmented with lot many unorganized players, retaining qualified and skilled manpower is a challenge. iii) Company’s EBITDA and PAT margins are expected to increase significantly with entry into high value added products. Company has achieved revenue CAGR of 20% with ROE of 21.4% over period of last 5 years. iv) Mold-Tek Packaging is the only company with integrated facilities for manufacturing In-Mold labeled containers and is India’s fastest growing packaging company with CAGR of 20%. To meet increasing demand and to tap opportunities in other consumer segments, company is about to set manufacturing units in UAE, Andhra Pradesh and North India. Company has already raised 55 Crores through QIP route and is working towards capacity expansion to cater the growing demand during next 2-3 years. v) Mold-Tek is taking all necessary steps to increase product offerings by expanding its product range. Company offers Food & FMCG packaging solutions with superior technology, in house tool room, robots, hot runner and IML labels. Mold-Tek is a dominant player with strong clientele which include companies like Castrol, Heinz, Asian Paints, ICI Paints, HUL, ITC, Cadbury, Indian Oil, British Petroleum etc. vi) Management has rewarded shareholders by paying consistent dividend since last 7 years. Company has been maintaining a healthy dividend payout above 27% during last 5 years, dividend yield at current market price is 1.4%. With expected increase in revenue and profitability in coming quarters, we believe company dividend payout will increase going forward. vii) As per our estimates, Mold-Tek Packaging Ltd can deliver bottom line of 255.4 million for full financial year 2016, annualized EPS of Rs. 18.4. With forward P/E ratio of 11.9X for FY16, valuations look attractive for a company which is expected to deliver strong revenue growth with increase in profit margins. viii) On equity of Rs. 138.4 million, the estimated annualized EPS for FY 15-16 works out to Rs. 18.4 and the Book Value per share is Rs. 86.9. At current market price of Rs. 218.50, stock price to book value is 2.5. Considering company’s aggressive expansion plans, focus towards high margin IML segment and recent allotment of equity shares to QIBs above current market price, Saral Gyan team recommends “Buy” on Mold-Tek Packaging Ltd at price of Rs. 218.50 for target of Rs. 450 over a period of 12 to 24 months. Add power to your equity portfolio by investing in best of small & mid cap stocks - Hidden Gems & Value Picks. Enjoy maximum savings and receive valuable freebies with Saral Gyan Dussehra - Diwali Offer by availing subscription of our Hidden Gems, Value Picks & Wealth-Builder services. Hurry! Dussehra - Diwali Offer is for limited period, it will disappear on 2nd Nov'16 at 11.59 pm.